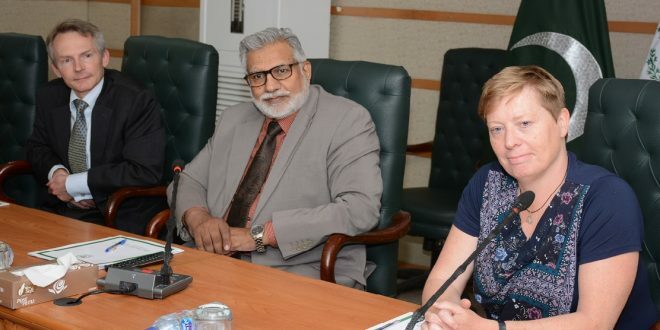 ISLAMABAD: (April 4, 2019): Ms. Ingrid Johansson, Ambassador of Sweden to Pakistan visited the Higher Education Commission (HEC) and called on Lt. Gen. (Retd.) Muhammad Asghar, Executive Director HEC at the Commission Secretariat. She was accompanied by Mr. Hans Pohl, Programme Director STINT (Swedish Foundation for International Cooperation in Research and Higher Education). The two sides discussed measures to revive Swedish-Pakistan collaboration in higher education and research fields. Talking to the delegation, the Executive Director said HEC, since its establishment in 2002, is pursuing its key objectives of access, quality and relevance of higher education and research. He maintained that HEC has made remarkable progress in terms of access as the university enrollment rate has jumped from 0.28 million in 2002 to 1.579 million at present, showing a tenfold increase. He said the number of universities in the country has reached 195 as compared to only 60 higher education institutions in 2002. He added that HEC has started pursuing the lines of focus on quality and relevance and launched a number of research-oriented programmes including Technology Development Fund, National Research Programme for Universities, Pakistan Programme for Collaborative Research, and Patents Support Programme. Besides, he underlined that HEC has established Offices of Research, Innovation and Commercialization in 66 universities in addition to 30 Business Incubation Centres in 30 universities with an aim to promote innovation and commercialization activities. Ambassador Johansson said Pakistan and Sweden have huge potential to enhance academic relations. she stated. On this occasion, Mr. Pohl shed light on the role of STINT in promoting international collaboration. He said STINT’s mission is to internationalize Swedish research and higher education and become a change agent in the higher education system. He said Pakistan is demonstrating tremendous progress in research initiatives and its publication volume is rapidly growing. Citing Scopus, he said Pakistan was third among 48 countries preceded by Iran and Saudi Arabia in having over 10,000 publications in 2017. The two sides agreed to enhance collaboration on reciprocal and mutually beneficial basis. The meeting was also attended by Dr. G. Raza Bhatti, Member Human Resource Development, HEC, Dr. Nadia Tahir, Managing Director Quality Assurance Agency, HEC, Dr. Mazhar Saeed, Director General Planning and Development Division, Mr. Tahir Abbas Zaidi, Director General, Attestation and Accreditation, Mr. Raza Chohan, Director General, Academics, Mr. Zainul Abideen, Director General Research and Development and other senior HEC officials.